The Raiders have missed the NFL’s Super Bowl LIII deadline for resolving their 2019 stadium situation, but they may be closing in on finalizing this saga. The likelihood that, after all of the talk of a move elsewhere following Oakland’s lawsuit, the Raiders will play in Oakland has increased. More discussions are on tap next week, with a near-future resolution in sight. Oakland and the Raiders had been discussing a $7.5MM lease for 2019, the franchise’s final lame-duck season before its Las Vegas move. Although the Raiders previously walked away from that deal after the city’s lawsuit, playing at the Coliseum for the $7.5MM amount is back on the table. It appears the prospect of the Raiders playing at the San Francisco Giants’ Oracle Park home has been scuttled. The 49ers refused to waive their territorial rights. Although, Matt Maiocco of NBC Sports Bay Area notes NFL bylaws indicate the league’s 30 non-Bay Area owners could supersede the 49ers in this case, that is not expected. Normally, relocations require a two-thirds majority vote; in this case, all 30 other teams would have to approve of the Raiders playing in San Francisco. A precedent of teams moving into markets already housing other teams is not one the NFL wants, per Maiocco. Additionally, the seven opponents set to face the Raiders in the Bay Area may well have objected to sharing a sideline with the Raiders on game day, Maiocco adds. That would have been the case at Oracle Park. The prospect of the Raiders playing at the San Francisco Giants’ Oracle Park has produced some notable reactions, none of which pointing to a solution having been reached yet. The Raiders remain without a 2019 home, and now San Francisco mayor London Breed came out against another team playing in the city. She has also directly informed the Giants about her view on this matter, according to Lisa Fernandez of KTVU. In addition to the Giants, the Golden State Warriors’ new arena, Chase Center, is scheduled to become a San Francisco sports site this year. Breed’s stance further complicates Raiders plans of potentially playing at Oracle Park. They entered into discussions with the Giants about this in December, but hurdles — from logistics, to league approval, to the 49ers’ San Francisco territorial rights — remain. The NFL prefers the team share Levi’s Stadium, a site that could accommodate two teams, with the 49ers. This is the hopeful outcome of the NFC’s Bay Area team as well, Matt Barrows of The Athletic notes (subscription required). The Raiders have discussed this option, but Mark Davis has thus far balked at being a one-year tenant at the 49ers’ stadium, per Albert Breer of SI.com. No deal between the Raiders and Oracle Park has been finalized, but negotiations appear to have picked back up. However, considering the obstacles impeding this move, Davis might have to settle on one of the two traditional Bay Area NFL sites. A path back to Oakland for one more pre-Las Vegas season remains possible, but nothing significant has transpired between the Raiders and the city that is suing them in recent weeks. Shortly after Super Bowl LIII, a report emerged indicating the Raiders had their decision on a 2019 playing site. The Silver and Black have an agreement to play at the San Francisco Giants’ Oracle Park, according to NBC Bay Area (Twitter link). But it appears there are still a few key hurdles to clear before the Raiders can play in another baseball stadium. The Raiders have not received approval from the NFL or the 49ers to make this move possible, Ian Rapoport of NFL.com tweets. The Raiders and the San Francisco Giants have not yet agreed to a deal, either, per NBC Sports Bay Area’s Alex Pavlovic. The sides are discussing one, only the MLB team remains under the impression the Raiders are negotiating with two other sites. Levi’s Stadium and Oakland Coliseum are widely believed to be the Raiders’ other two 2019 options. Despite playing their home games in Santa Clara, the 49ers could block the Raiders from playing at Oracle due to having territorial rights to San Francisco. The NBC Bay Area report indicated the NFL would announce the Raiders-to-Oracle move this week, the NFL could also nix this. While the league did indeed conduct another site survey regarding the Raiders shifting from sharing a ballpark with the Oakland Athletics to doing so with the National League West club, barriers remain en route to this interesting future, Jason La Canfora of CBS Sports notes. 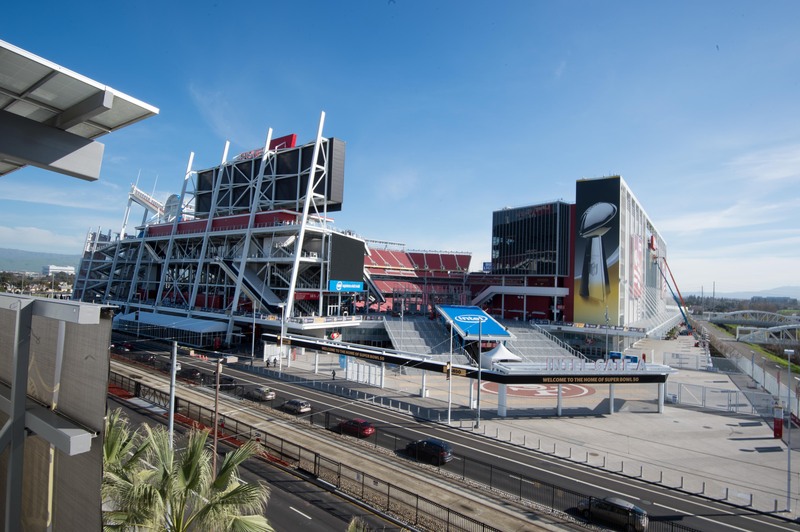 The NFL will need to sign off on the playing field at the San Francisco baseball stadium, while security upgrades will need to take place, in order to meet league standards, per La Canfora. Meetings regarding whether or not the NFL will agree to make those necessary enhancements will transpire this week. Oracle Park was considered for a possible XFL team, NBC Sports Bay Area adds. The site hosted XFL games in 2001 and bowl games for more than a decade. The city of Oakland’s lawsuit against the Raiders prompted them to explore other options; the Silver and Black pulled a one-year lease extension — for more than double their 2018 payment — off the table following the lawsuit. Super Bowl LIII represented the apparently soft deadline for the Raiders to finalize their decision, but the league does want this decision to be made before schedule meetings begin soon, JLC adds. The NFL wanted the Raiders to have their 2019 setup worked out by Super Bowl LIII. With four days remaining until the season’s signature event, the franchise still does not know where it will play next season. However, a region is now known. The Raiders were loosely connected to places like San Diego, Portland and Reno, Nev., but the team will play the 2019 season in the Bay Area, Jason La Canfora of CBS Sports reports (video link). But it’s still unknown which stadium will be the Raiders’ home in their final lame-duck season. Roger Goodell said Wednesday he believes Mark Davis‘ preference is to keep his team in the Bay Area next season, and Ian Rapoport of NFL.com adds (video link) the Raiders and 49ers have engaged in discussions about sharing Levi’s Stadium next season. This would be the NFL’s preferred option, per La Canfora. 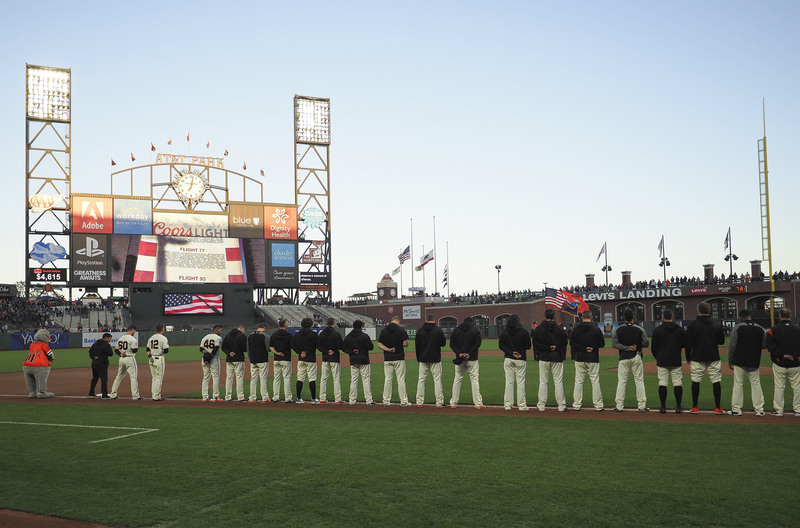 The San Francisco Giants’ AT&T Park remains in play, and the Raiders discussed this with the MLB franchise recently. But it sounds like that is the least likely option, with the 49ers still having the right to block this from happening due to possessing territorial rights in San Francisco. The NFL has done site studies on the Raiders’ sharing a stadium with the 49ers and the prospect of them using the San Francisco MLB venue, per JLC. Option 2 appears to be staying at Oakland Coliseum. The Raiders were planning to reopen dialogue with the city of Oakland, but Rapoport adds this has yet to take place. The lawsuit Oakland filed against the Raiders and the NFL brought this uncertainty about the Raiders’ 2019 home, but Davis has been lukewarm about sharing a venue with the 49ers in the past. 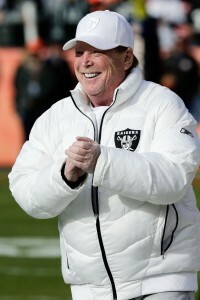 No 2019 lease agreement was in place between the Raiders and the Coliseum before the lawsuit. The Raiders are on track to move to Las Vegas in 2020, but their 2019 location should be known soon, considering the “significant” backlash expected to come their way from the league if no solution surfaces by the Super Bowl. The city of San Francisco does not have an NFL team playing within its city limits, with 49ers home games being played at the Santa Clara-based Levi’s Stadium. It’s possible that may change in 2019. 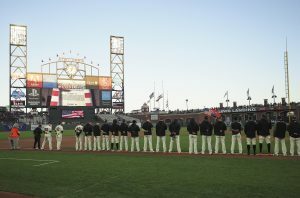 The Raiders have engaged in discussions with the San Francisco Giants about playing their home games next season at AT&T Park. With Oakland suing the Raiders, the franchise’s 2019 home is much less certain than it once was. The team’s Las Vegas domed stadium is not scheduled to be ready until 2020, and this suit may scuttle the Raiders’ intentions of playing one more season in Oakland. A few cities have reached out to the team, Raiders president Marc Badain said (via Vince Sapienza of Fox 5, on Twitter), adding the Raiders intend to speak to a few sites about a solution they hope doesn’t disrupt the team much. Mark Davis said all options remain open. Davis and Giants CEO Larry Baer were part of discussions for San Francisco to host the 2024 Olympics years back, per ESPN.com’s Paul Gutierrez. While AT&T Park has been mentioned previously, Gutierrez notes other cities — Reno, Nev., Glendale, Ariz., San Diego and a temporary partnership with the 49ers at Levi’s Stadium — remain in play. Oakland also remains an option, in the event a deal can still be brokered. Portland and Seattle have also been mentioned as stopgap solutions, but the NFL appears to view the best solution being the Raiders staying in the Bay Area. A possible stumbling block to the Raiders playing at the National League stadium is the 49ers having territorial rights to San Francisco. The 49ers would need to consent to the Raiders playing at AT&T Park, Ian Rapoport of NFL.com tweets. The 49ers have previously expressed that they would be open to the Raiders sharing their Santa Clara stadium but have not addressed a possible scenario where the Raiders play in San Francisco. Davis has not shown much enthusiasm for sharing a stadium with the 49ers. AT&T Park, which can hold 45,000 fans in an expanded football capacity, is a much closer trek from Oakland compared to Levi’s Stadium. In addition to housing the Cal Golden Bears in 2011, the MLB venue was home for the XFL’s San Francisco Demons in 2001. A bowl game (an event now known as the Redbox Bowl) was also played there from 2002-13. Interestingly, the bowl games and Cal’s home contests in 2011 featured both teams standing on the same sideline, Gutierrez points out. Last week’s lawsuit placed the Raiders in a strange situation as what was expected to be their penultimate Oakland season wraps up. They are considering several cities to be their 2019 home, but Oakland may still be an option, Jason La Canfora of CBS Sports reports. The lawsuit’s timing appears to be a key factor in this process. The Raiders will face significant backlash from the NFL if they cannot arrive at a solution by Super Bowl LIII, La Canfora reports, with marketing, stadium availability dates and the compilation of the 2019 schedule representing key issues for the league regarding the Raiders. The team will also need NFL approval to leave Oakland for another city next season. Mark Davis previously expressed little interest in sharing Levi’s Stadium with the 49ers, but JLC adds there is a “strong sense” at the league office the Bay Area will be the best option for the 2019 Raiders. Some NFL executives believe that would be the best solution — that, or the Raiders playing at AT&T Park in San Francisco, where Major League Baseball’s Giants play. If the Raiders would be interested in playing at the 49ers’ Santa Clara, Calif., stadium, the 49ers would welcome them, Ian Rapoport of NFL.com reports (video link). Reiterating a possible option being San Diego, Rapoport adds Cal-Berkeley is another. No lease agreement between the Raiders and the city of Oakland exists for 2019, and this lawsuit figures to make talks for one final lame-duck agreement difficult. Although, Davis said at last week’s owners meetings he has not ruled out one final Oakland season. This was initially the plan, prior to the lawsuit. But the team has been exploring alternatives to a 2019 Oakland season for months, JLC writes, adding that the Raiders were “stunned” by Oakland following through with its long-rumored suit. One more home game remains on the Raiders’ schedule — a Christmas Eve Monday night clash with the Broncos — and it’s uncertain (again) if this finale will be the Raiders’ Oakland sendoff.